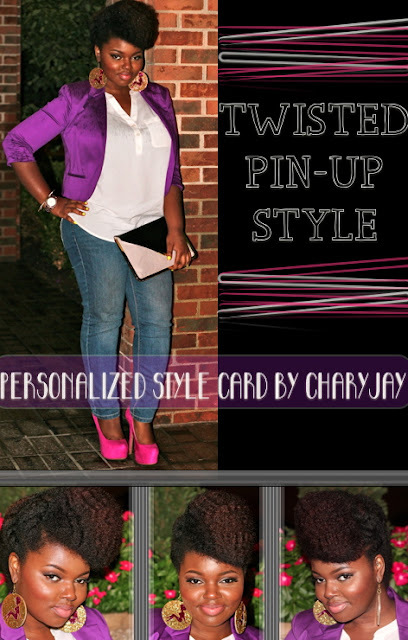 CharyJay.com: Get the Look from the Style Cards! 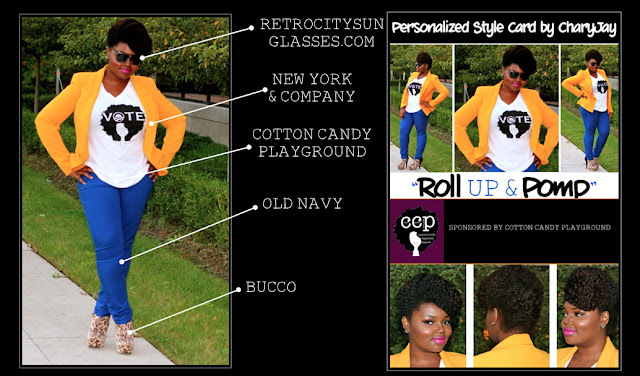 Get the Look from the Style Cards! After several weeks of answering question after question of "where do you get that blazer from?" 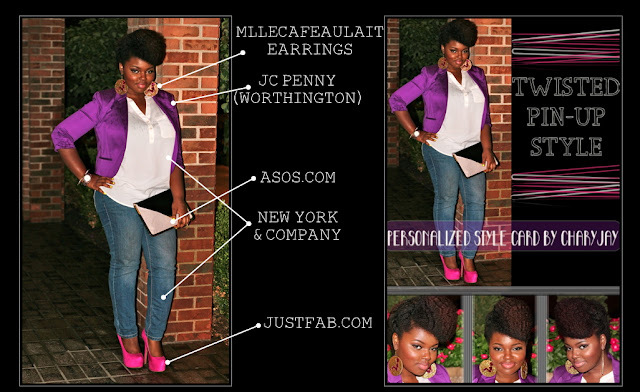 and "where do you shop for your accessories?," the "Get the Look" post is finally here! I'm always excited to bring another new and innovative hairstyle for the Personalized Style Cards, but getting dressed for them has become just as exciting as well! I had no idea that starting this venture would get me so interested in fashion, but it has! 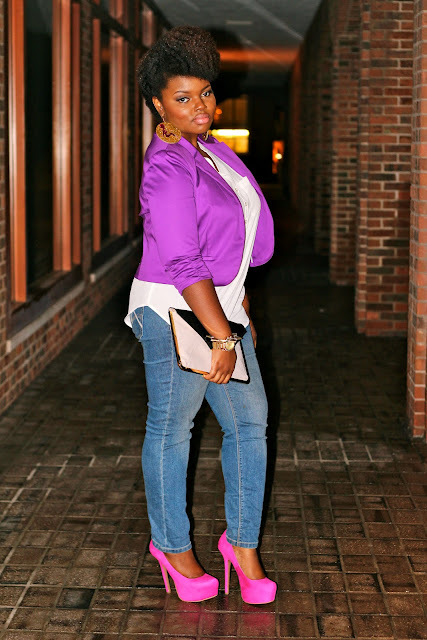 Please stay tuned to the blog for more posts on outfits, fashion, trends and more. 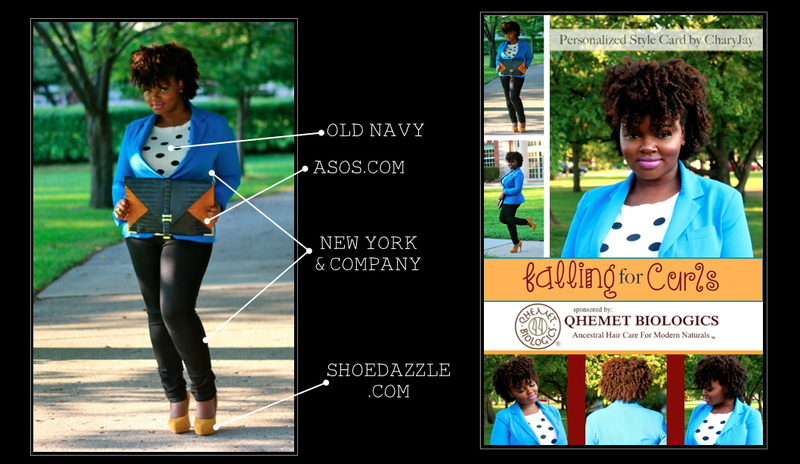 I've got some new and exciting things in store for ol' Chary-Jay.com and I can't wait to share with you all! The "Twisted Pin Up" Personalized Style Card was the second one to be released and I was super geeked! As soon as I released a picture to tease the card, everyone was ranting and raving about this outfit! It was actually quite shocking because everything you see here was stashed in my closet for quite some time. Only the shoes and the clutch were new purchases. I guess that's what everyone means when they tell you to mix the new with the old to put together something different and unique. It worked! Yes, that's rain drops on my blazer. As soon as we started to get close up shots of my hair, the rain came falling down. Luckily, these were the last pics that needed to be taken! 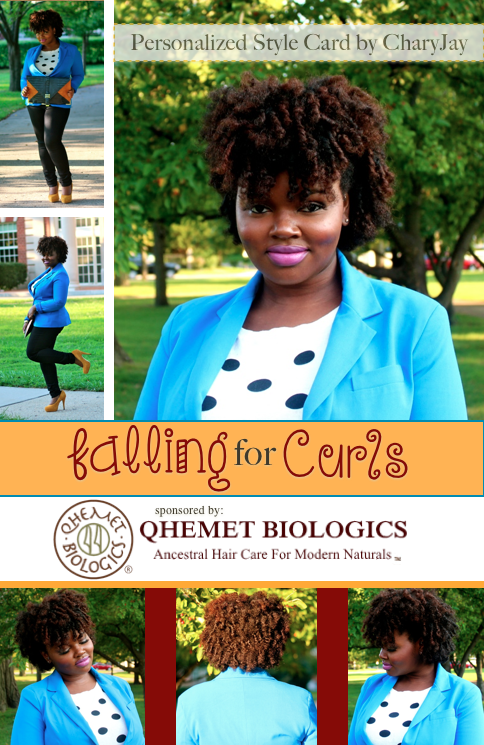 The "Falling for Curls" Personalized Styled card marked the third card and the first sponsor! I was so elated about this card and the style. 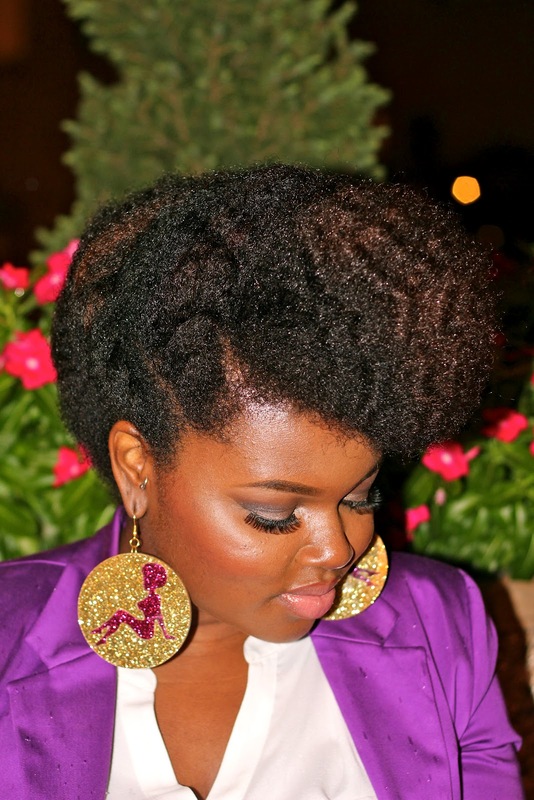 As soon as I put on my makeup and slid into my clothes, I knew this was going to be a huge hit! I decided to have fun with this outfit and combine colors and prints I've never worn before: blue, mustard and polka dots. Who knew the outcome would be so cute?! If I go out after I take the Style Card pics and get bombarded with questions and compliments about my hairstyle and outfit, then I know I have a winner! 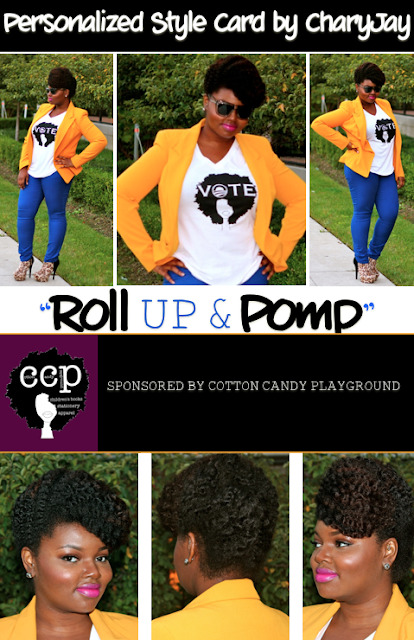 That was the case with this style for Personalized Style Card number four: "Roll Up and Pomp." 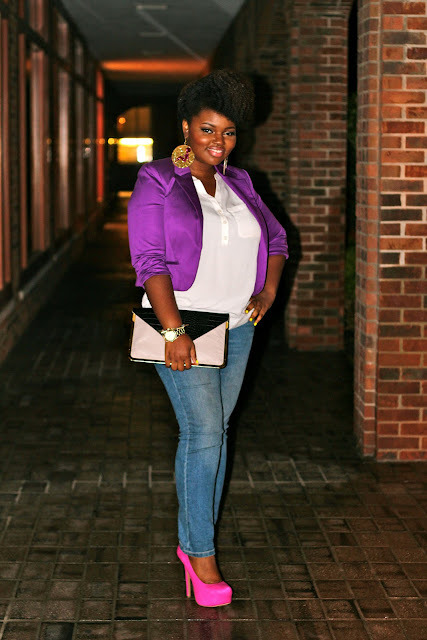 This blazer has made my favorite list every since I bought it at my favorite store, New York and Company. What can I say, yellow just works for us brown girls! And for such a long time I was told to stay away from it. Tsk, tsk! Look at what I've been missing out on! Well I hope that helps some of you guys out who's been wondering where I've picked up these fab pieces! If you have any other questions leave them below in the comment box! 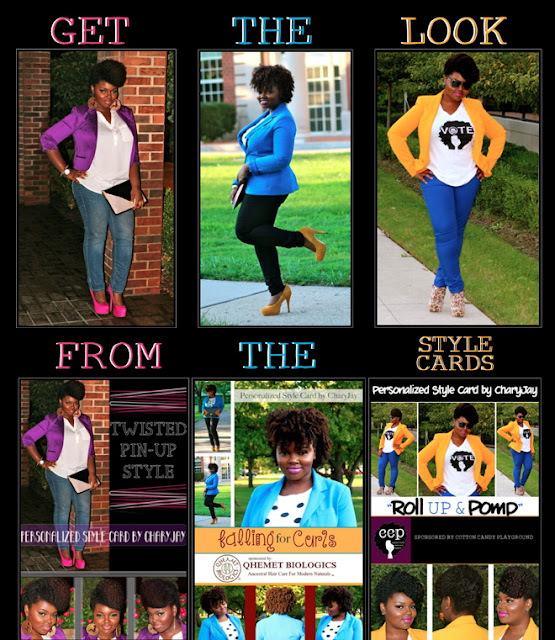 Also, if you haven't picked up any of the cards below, you can find them here: http://cjstylecards.bigcartel.com/. FLY! All I wanna know about that pic with the raindrops, "Why you ain't runnin'" LMAO!